When ordering please order ONLY even # sizes as noted below. If your goat is an odd # size, it is usually best to go to next even # size. Please refer to measuring diagram on how to measuring page on how to measure your goats and sheep. Picture above are the styles of goat/sheep coats and sheets that I make. I have a wide variety of colors/prints, these are just a few. NOTE: See page on measuring your goat/sheep. The measurement you get by going by the red line is the size/length you need to order. The 2nd measurement shown on sizes is the drop or how long the sides of the coat will be. I do NOT do odd # sizes. Sizes below are NOT your goat's back length. 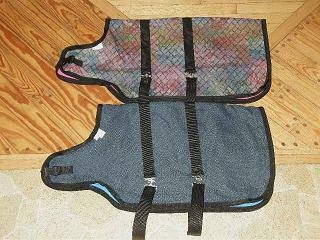 Adjustable leg straps can be added to any of these sizes, 26" to 44" for a cost of $4.50. These can be made with nickel plated spring snaps/d-rings or the plastic quick release closures. These have a d-ring sewn on the bottom edge and the webbing/snap/slide sewn on the back edge of the coat. 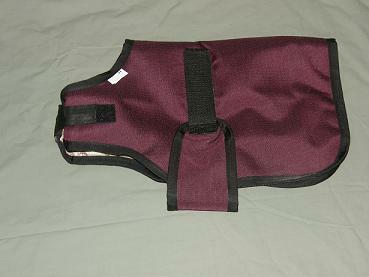 Elastic leg straps can be added to any size coat, cost for sizes 10" to 24" is $2.50 extra. Cost for sizes 26"-44" is $3.00 extra. These are sewn on at the bottom edge and back edge. These do not adjust. Open fronts on styles 1, 2, 3, 4, 5 & 7 can be done with a hook/loop closure, bar buckle/webbing or a quick release closure. Style 6, show sheet, hook/loop front closure only. 1. Outer layer is a durable herculon material. I have plaids, solids and geometric designs. Click here to see FABRIC SWATCHES. 2. Lining will be either a blanket fleece, a poly-cotton quilted or a 3-ply rayon/polyester blend with hollow core fibers. Customers choice on order form. NEW: white sherpa fleece or brown faux fur lining now available for an additional $2.50 per coat on these sizes. 3. Open front, buyer's choice of closure. 4. 2 adjustable black surcingles (belly straps). 5. Back seam double stitched. 6. Bound in black polypro binding. 7. 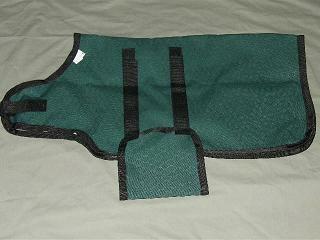 Optional bellyband can be ordered instead of 2 adjustable surcingles for an additional cost. The belly band will have 2 hook/loop closures. Constructed of one of the following: 400 denier nylon, 420 denier poly, 600 denier poly, 800 denier poly or 1080 denier poly materials. NOTE: Water-resistant is not the same as waterproof. Water-resistant means the fabric will repel moisture for a time but not as long as a totally waterproof fabric. Even waterproof fabrics will lose their effectiveness over time. I also advertise our coats as water-resistant since they do have a back seam and this can let moisture seep in. Moisture can also seep in where the surcingles are sewn across the coat. The best way to seal off the back seam or stitching from the surcingles is to buy a waterproofing spray and spray along the seam/surcingles to seal it off. 1. Outer layer one of the water-resistant deniers or a printed denier nylon. 2. Lining will be either a blanket fleece, a poly-cotton quilted or a 3-ply rayon/polyester blend with hollow core fibers. Customers choice on the order form. NEW: white sherpa fleece lining or brown faux fur fleece now available for an additional $2.50 per coat on these sizes. 7. Optional belly band can be ordered instead of 2 adjustable surcingles for an additional cost. The belly band will have 2 hook/loop closures. 1. Outer layers the same as style 1 and 2 above. See links above. 2. Lining will be blanket fleece, a poly-cotton quilted or a 3-ply rayon/polyester lining. Customer's choice on the order form. NEW: white sherpa fleece or brown faux fur lining now available for an additional $2.00 per coat on these sizes. 3. Open front with buyer's choice of closure. 4. Belly Band with hook/loop closure. These sizes are not available with 2 surcingles (belly straps) since there is not enough room. 5. The hook has been re-inforced with webbing. 6. Back seam double stitched. 7. Bound in black polypro binding. Sizes Prices: Style 3 winter coats Style 4 winter water-resistant. 1. The sheets are constructed of either cotton twills or poly-cotton blends, in these solid colors: natural, red, kelly green, light pink, orange, royal, turquoise, tan, beige, rose, salmon, baby blue, greenish/silver, gray tweed and purple. Limited yardage on kelly green, purple, natural, greenish/silver, tan and beige. Email us for availability before ordering. 2. Sizes 26" to 44" can be done with your choice of open front. Sizes 16" to 24" will have a hook/loop closure. 3. Sizes 26" to 44" have 2 adjustable black surcingles. 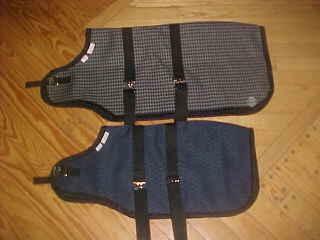 Sizes 16" to 24" have a bellyband with a velcro closure. 4. Back seam is overlocked with a safety stitch and then the seam is top stitched. 5. Bound in black binding. Great to use at the shows to keep your goats/sheep clean. 1. Constructed out of a polyester jersey mesh material (Open weave to allow for air flow. Colors: purple, red, navy, royal, light blue, slate blue, light gray, dark gray, light pink, medium pink, orange, white and gold. 2. Availabe in sizes 26" to 44" only. NOT available in sizes 16" - 24". 3. Open front with 1 hook/loop closure. 5. Back seam has webbing. 6. Bound in black binding. NOTE: size below is length, DROP lengths are the same as noted above. If this is your first time ordering please read the info on the shipping/payment info page. To order please complete the order form with the style number, color, lining, any extras and quantity needed. Style 1 Winter in either a herculon, poly-cotton twill, acrylic/polyester blend or polyester knit fabric and style 2 winter water-resistant coats are constructed out of the same materials as larger winter or water-resistant coats above. See links above for style 1 herculon swatches and style 2 water-resistant swatches for color choices. ~NOTE~ I do not have a swatch page for the polyester knit, twills or acrylic blend fabrics since I don't have a lot of fabric in any one color and not enough to put swatch pictures. If you want the polyester knit or acrylic blend for the outer, I will do them assorted. Twill colors are listed under style 5 summer sheets. These 2 styles are lined with blanket fleece only since it works best for these newborn sizes. NOTE: All of my newborn styles are done with a belly band and a single hook/loop closure and a single hook/loop closure on the front. Style 3 These coats are constructed out of assorted types of blanket and polar fleece. In the following colors: light blue, bubblegum pink, pale pink, red, navy, rust, bright green, medium green, kelly green, celery green and black. Style 4 These coats are constructed out of a single layer of berber fleece. The fleece (fuzzy) side is against the kids. Colors: blue/black/gray stripe, burgundy plaid, navy/green/white plaid, olive green patchwork plaid, blue/black/gray plaid, green/gray/black plaid, green/gray/white plaid. These all have a contoured front to allow for more freedom of movement. First measurement is overall length of coat and the measurement you'd get going by the red line on the goat diagram on the measuring page. These all come with my standard drop sizes that I know work for newborn kids/lambs. A girth measurement is *not* necessary for newborn sizes. Prices: style 1 winter Style 4 berber Style 2 water-resistant Style 3 polar fleece. Style 4 Plaid or stripe berber fleece. If you want to order any of my products you will need to fill out our order form on any product page. I can not take credit card payments over the phone or on our website. I process credit/debit card payments through Paypal ONLY. This is on my homepage and my policy/shipping page.